A brief scientific guide to the first day of fall. The autumnal equinox is upon us: On Saturday, September 22, both the Northern and Southern hemispheres will experience an equal amount of daylight. For those of us in the Northern Hemisphere, it marks the beginning of fall, with daylight hours continuing to shorten until the winter solstice in December. For those south of the equator, it’s the beginning of spring. 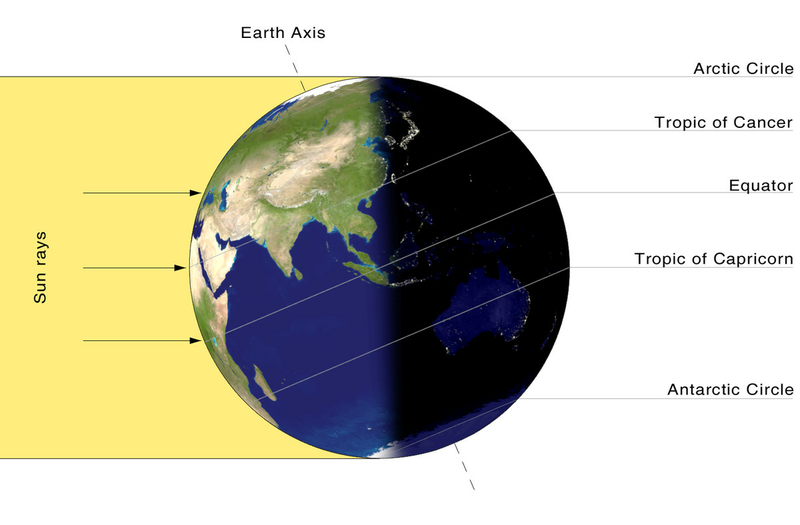 Technically speaking, the equinox occurs when the sun is directly in line with the equator. This will happen at 9:54 pm Eastern time on Saturday. Below is a short scientific guide to the most equal night of the season. 1) Why do we have equinoxes? The fall and spring equinoxes, the seasons, and the changing length of daylight hours throughout the year are all due to one fact: Earth spins on a tilted axis. The tilt — possibly caused by a massive object hitting Earth billions of years ago — means that for half the year, the North Pole is pointed toward the sun (as in the picture below). For the other half of the year, the South Pole gets more light. It’s why we have seasons. 2) How many hours of daylight will I get Saturday? Equinox literally means “equal night.” And during the equinox, most places on Earth will see approximately 12 hours of daylight and 12 hours of night. But not every place will experience the exact same amount of daylight. For instance, on Saturday, Fairbanks, Alaska, will see 12 hours and 16 minutes of daylight. Key West, Florida,will see 12 hours and seven minutes. The differences are due to how the sunlight gets refracted (bent) as it enters Earth’s atmosphere at different latitudes. You might also notice that both of these locations have daylight times longer than 12 hours. Aren’t day and night supposed to be equal? Daylight time is slightly longer than nighttime on the equinox because of how we measure the length of a day: from the first hint of the sun peeking over the horizon in the morning to the very last glimpse of it before it falls below the horizon in the evening. Because the sun takes some time to rise and set, it adds some extra daylight minutes. Check out TimeAndDate.com to see how many hours of sunlight you’ll get during the equinox. 3) Can I really only balance an egg on its tip during on the equinox? Perhaps you were told as a child that on the equinox, it’s easier to balance an egg vertically on a flat surface than on other days of the year. This is a myth. The amount of sunlight we get during the day has no power over the gravitational pull of the Earth or our abilities to balance things on it. You can balance an egg on its end any day of the year (if you’re good at balancing things). 4) When do the leaves start changing colors? When days begin to grow shorter, deciduous (green leafy) trees start signaling to their leaves to stop producing chlorophyll, the green pigment responsible for the leaves’ color and photosynthesis. Because the color change is more dependent on light than temperature, it takes place at basically the same time year after year, according to the US National Arboretum. Temperature and weather conditions, though, can impact the intensity of fall colors and how long they linger. They can also subtly affect the timing of when the leaves start to change. And drought can change the rate at which the leaves turn. For instance, drought in Maine has meant the state’s trees have turned amber a bit early. Because of all the variables at play, it can be tough to predict precisely when fall colors will peak, and how long they’ll last, in a particular area. But here’s an admirable effort: The website SmokyMountains.com (a site promoting Smoky Mountains tourism) created this interactive map (click the link to play with it) to determine peak fall colors across the United States by county. 5) What is actually in “pumpkin spice”? “Pumpkin spice” is not a single spice but a blend of them. And it contains no pumpkin. This recipe from Epicurious includes cinnamon, ginger, allspice, nutmeg, and cloves. It’s autumn — go ahead and sprinkle it on whatever you like. 6) Is there an ancient monument that does something cool during the equinox? During the winter and summer solstices, crowds flock to Stonehenge in the United Kingdom. During the solstices, the sun either rises or sets in line with the layout of the 5,000-year-old-monument. And while some flock to Stonehenge for the autumnal equinox too, the real place to be is in Mexico. That’s because on the equinox, the pyramid at Chichen Itza on the Yucatan Peninsula puts on a wondrous show. Built by the Mayans around 1,000 years ago, the pyramid is designed to cast a shadow on the equinox outlining the body of Kukulkan, a feathered snake god. A serpent-headed statue is located at the bottom of the pyramid, and as the sun sets on the day of the equinox, the sunlight and shadow show the body of the serpent joining with the head. 7) Are there equinoxes on other planets? Yes! All the planets in our solar system rotate on a tilted axis and therefore have seasons. Some of these tilts are minor (like Mercury, which is tilted at 2.11 degrees). But others are more like the Earth (23.5 degrees) or are even more extreme (Uranus is tilted 98 degrees!). 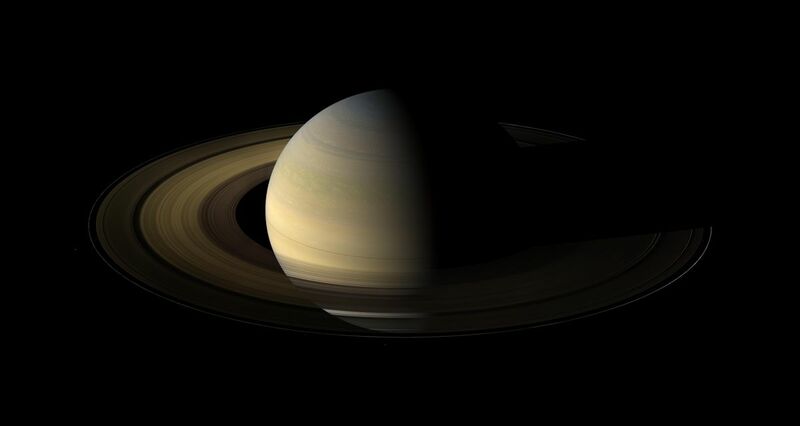 Below, see a beautiful composite image of Saturn on its equinox captured by the Cassini spacecraft (RIP) in 2009. The gas giant is tilted 27 degrees relative to the sun, and equinoxes on the planet are less frequent than on Earth. Saturn only sees an equinox about once every 15 years (because it takes Saturn 29 years to complete one orbit around the sun). During Saturn’s equinox, its rings become unusually dark. That’s because these rings are only around 30 feet thick, and when light hits them head on, there’s not much surface area to reflect.